Don’t tempt me with a $3 beer at 11 a.m. when I’m on vacation. I just might bite. With my friend away for meetings, I did some exploring of the city by myself. I was hoping to find some place cheap, and also eat slightly healthier due to the damage I did the day before. Well, I was able to accomplish this…sort of. 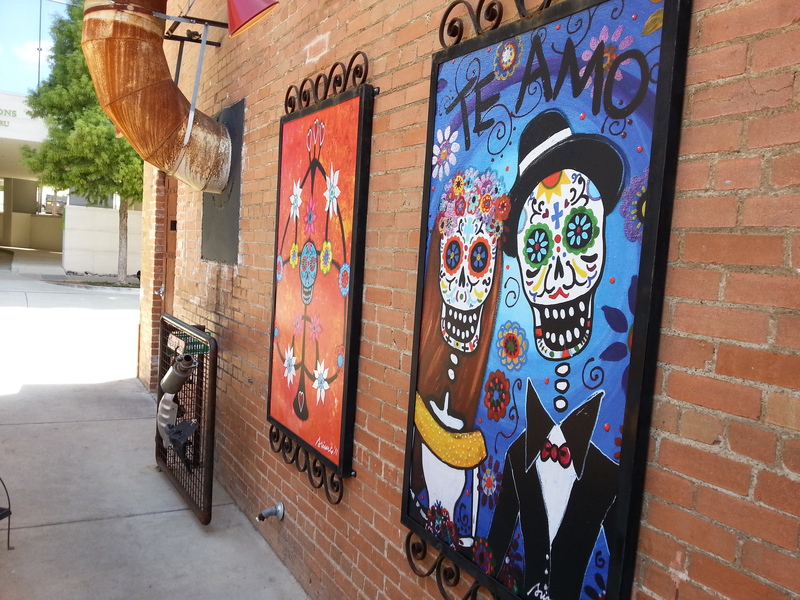 There are two Mexican Restaurants on McKinney Avenue. It was about 10:45, so they were not open just yet. I would have waited, but that would have been a pretty expensive early lunch. So, I took a walk around the corner, and directly behind the first restaurant was this charming little patio area called Taqueria La Ventana. I walked over, past dancing skeletons and toilets that had been converted into flower pots. On the wall was the main menu, which contained some of the more affordable prices you will find in this city (along with the Record Grill). It included beers and margaritas for under $4. I went with a Modelo. The guy behind the counter (you order through a window) gave me a slice of lime to go with it. For my meal, I got a breakfast burrito consisting of egg, cheese, and potatoes, which was $5.25. It was massive; the picture doesn’t do it justice. I added sides of rice and beans (because, why not?) at 75 cents each, and along with the beer, all came to around $11. Not bad considering I left stuffed, and not able to finish. 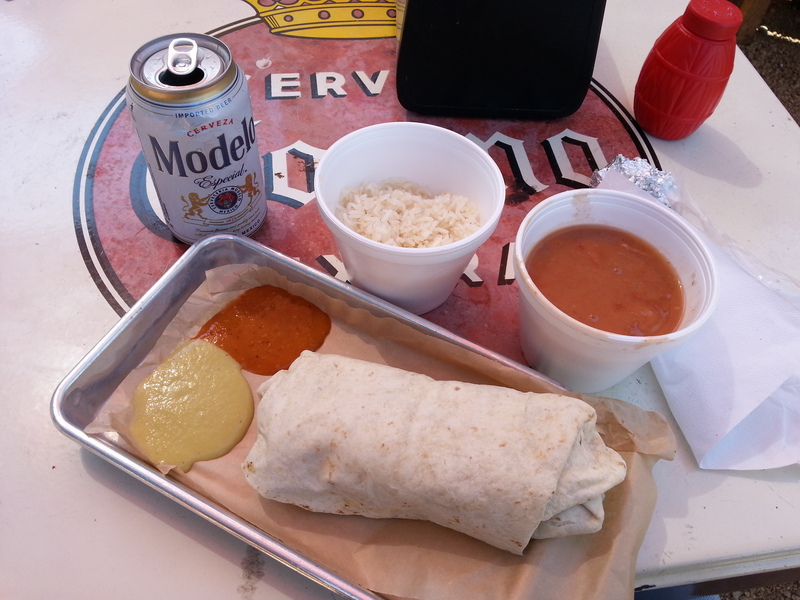 The burrito was as solid as a boat anchor, and the beans were well-seasoned and even featured chunks of bacon, which I did not know about. So, my attempt at a vegetarian breakfast went out the window, but it was worth it. They even had a selection of hot sauces to try (unfortunately, none of them were too spicy). Definitely check this place out. The seating area is quirky and covered by large tents and umbrellas which do an okay job of blocking the intense sunlight. The food is authentic, hearty, and fresh, and you can’t beat the drink prices. La Ventana gets 4 out of 5 stars from me. I imagine it must be a hopping place at night. This post was originally published here. 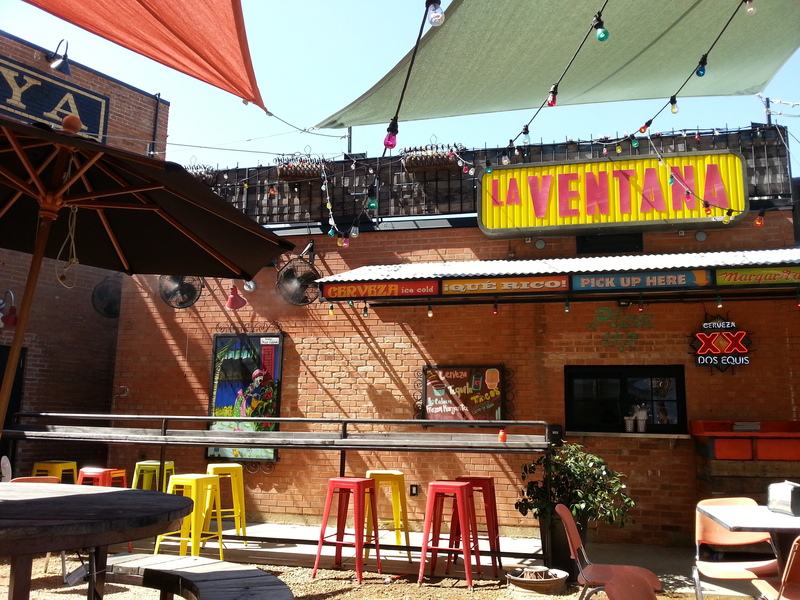 Taqueria La Ventana is located at 1611 McKinney Avenue in Dallas, Texas.